IoT or Internet of things is playing a significant role in transforming the ecosystem of the education sector. A smart institution has all the amenities available to make the system run evenly. From smart boards to smart classes, every gadget plays a crucial role in building a smart environment. 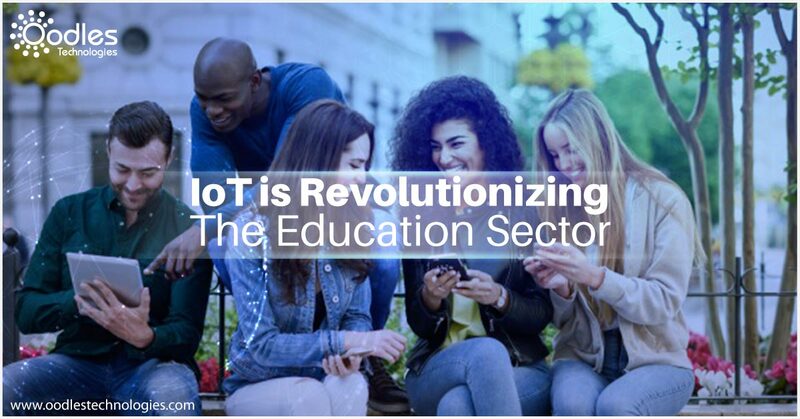 IoT enabled education ecosystem is not only limited to the smart colleges and institutions, but also in creating a pro study environment for students. In one of our previous blogs, we have showcased some of the crucial roles IoT will play in the education sector. Today, we will tell you about some use cases of IoT that are steering a technology revolution in the education sector. IoT based apps in education sector are imperative because they help in getting the most suitable technology solutions of the problems inside the classrooms. It incorporates exigency pointers, audio improvement gadgets, wi-fi and so forth that offer bright students strong confidence in learning. IoT empowered communication frameworks are using different cases, such as extraordinary emergency tones, live notices, several plans, and pre-recorded instructional messages so as to coordinate the gathering of workers and students at the point of crisis. Students can take help from an incredible podium which incorporates IoT enabled smart boards. It encourages the instructors to give more clarification to the students taking help of online display boards and videos. Students are more responsive to gaming based pedagogy, as they are more interactive, offering rewards based learning. They are successful tools that can make learn topics while playing games. Online devices and bundles help to instruct the students more effectively than paper or chalkboards. The current generation, especially Gen Y and Gen Z, are oriented towards hi-tech educators involving traits like web browsing or even alter video and offer digital assignments. An IoT enabled staff participation device ensures the security of an educational organization helping schools and colleges in numerous ways. It enables the institution to include the indispensable records promptly into the device. This assists them by saving time in communication, authorizing institutional officers to convey quickly to the guardian of the child. Moreover, it offers the decision to the students to confirm their supper for the day. IoT has the potential to completely transform the education sector. Whether it is the invention of more student-friendly IoT enabled gadgets. Also, IoT can lower the destruction and save lives in the calamity situation. The universities and schools are using explicit safety measures.